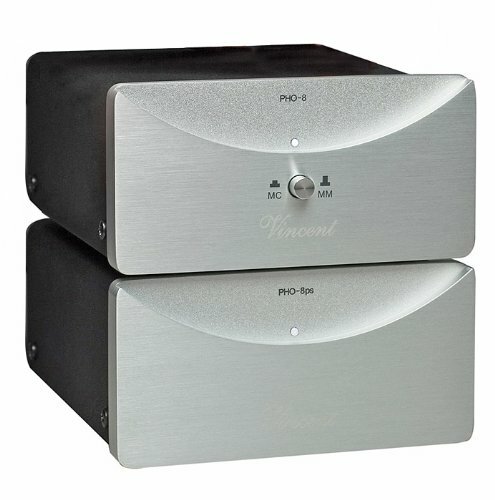 Don't look for a puny 'wall-wart' power supply accompanying Vincent's gorgeous sounding and beautiful looking PHO-8 MM/MC phono preamplifier. Instead of including a standard wall adapter or incorporating an underpowered AC supply under the hood, the German-based audiophile company went all the way with a superb sonic solution. The PHO-8 uses a significant external power supply housed in a separate chassis for a no-compromise approach to sound quality. Feeling is believing. The power unit weighs around three pounds and has impressive heft when held in the hand. Thanks to a massive transformer and superior power regulation, AC power line ripples and interference are completely eliminated. The PHO-8's power supply unit connects to the phono stage unit via a five-pin DIN-plug. This dual chassis approach is one of the major factors that makes the PHO-8 such a superior component. The separate-chassis phono stage unit accommodates both MM moving magnet and MC moving coil cartridges. A front panel switch lets you choose between them. High-quality parts are used throughout the construction for extremely low noise operation. The MM section delivers a greater than 84 dB signal-to-noise ratio, while the MC section delivers greater than 71 dB ratio, with total harmonic distortion of less than 0.02%. Both the power supply and the preamp units boast an exemplary metal case that testifies to the quality of the PHO-8. The attractive 10mm-thick aluminum front panel follows the design of Vincent's PremiumLine series. Stack 'em to conserve space . They look great together. The PHO-8 includes one pair of RCA inputs plus a ground, and one pair of RCA outputs. It also includes a detachable IEC-style power cord and a rear-panel fuse.